Have you tried many times to find the right planner to keep your time organized? Maybe you’ve gone to a conference session or watched YouTube videos and come away determined to stick with it this time. You spend hours googling planners, drooling over beautiful photos and searching for the best buy and the perfect layout. You get a coupon code, choose a cover and click Buy Now. The planner arrives and you open the box with high hopes. Maybe you spend a lot of time transferring dates and decorating with colored pens, washi tape and stickers. Then comes the moment you’ve been waiting for. You start to actually use the thing. You write lists and appointments on its pages. For about two weeks. Then it gathers dust on the shelf and you feel guilt and shame over your failure. Now some of you will read this and think, “No way! I LIVE by my planner! I use it every day and take it everywhere!” If that’s you—you go, girl! But for those who think there’s something wrong with you or think you just haven’t found the perfect planner yet, hang on. There’s nothing wrong with you. There’s nothing wrong with the planner. Well, there’s not much wrong with some planners. Maybe your planner was not a good fit because you tried to use it in a way that goes against your instincts. To me, instincts are another way of saying “the way God created you.” If you’re not naturally organized or if you don’t like a strict schedule, you’re not bad or wrong. Those are not your strengths. That’s not an excuse to live in filth or be late to every appointment, you’re just not going to carry it to a degree of orderliness and detail that someone else would. I’m home with my kids a great deal of the time, homeschooling and running a successful home business. I’ve had coaches tell me that I need to make a strict schedule and create detailed systems. I tried for years to do that but found myself resisting mightily. After recently reviewing the results of the *Kolbe Assessment I had taken a few years ago, I realized why. It’s just not my nature. Should we continually refine our work habits and seek ways to be more productive? Yes. Should we pay attention to areas of life that are not working well and figure out a solution? Absolutely. But we shouldn’t shame ourselves and compare and beat ourselves up if someone else’s system and planner doesn’t work for us. Some people who are naturally organized don’t consider that God created us all differently. They might have a hard time understanding why someone else can’t do things like they do, especially when they made a YouTube video and wrote a detailed blog post with gorgeous photos. Rule of thumb: If you feel a little sick and overwhelmed and unworthy when you look at someone else’s system, they probably don’t operate in your strengths. Wish them well and click away. On the other hand, you will probably eventually find someone whose system or planner speaks to you. Pay attention and glean what you can use, even though you’ll need to adapt it for your life. End the planner shame and guilt by paying attention to what has worked for you in the past. When was a time that you got a lot done and felt the satisfaction of accomplishment? What tools helped you? What part of your planner is not working for you—the layout, too visually busy? What is it costing you to be disorganized with your time and work? For instance, I’ve realized that it shuts me down to look at the entire week’s business to-do’s on a 2-page spread, but I like the visual overview of the week. So I transfer one to-do to one sticky note. I make 2-3 sticky notes and close the planner. The notes are stuck elsewhere on my desk and only the one I’m working on is next to me, and I glance at it frequently. This little tweak helps me focus, and I get the satisfaction of crumpling the sticky note AND marking the item off my list. The main thing is to know thyself….and love thyself. You have great strengths in your instincts, and you’ll get more done when you work in your strengths. 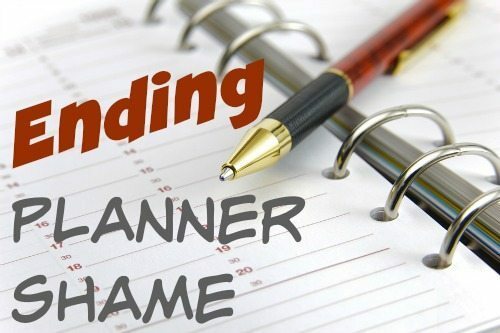 End your planner shame by not blaming and judging yourself. Use that emotional energy to think about what WILL work for you, then proudly figure out your own ways of getting things done. *Kolbe Assessment: It’s not a personality test, it tells you how you instinctively get things done when no one else is telling you how to do them. A little pricey at $50, the information is valuable nonetheless because it’s the only test I’m aware of that helps you understand your work style. www.Kolbe.com (Just sharing a tool, I don’t benefit if you decide to take it). Have you been on the planner merry-go-round? What have you figured out about yourself and how you work best? No shame! Great timing with this article! I am not having planner shame but planner frustration which came to surface this week. I am not using my current planner like I should. So something is not clicking for me. I like the visual whole week spread on 2 pages, but the 3 part funnel down system is overwhelming. (Charlotte, you may know what I am talking about with this planner) It is still usable for me. I just need to make it my own. The top row I am going to put brightly colored positive messages for my own personal growth on sticky notes. That way I can transfer them to the next week tops pages. I will be focused on the middle column the most to check things off. The bottom row is the actual scheduling in time slots. That is where I will most likely put my “set” appointments highlighted in bright yellow! I will also cover the front differently with words (Photos) of all the items that make up my life to visually help keep my life in balance. So I have plans for my planner! Thanks for your article today! Glad this helped, Deb! You are on track–adapt and do what works for YOU!